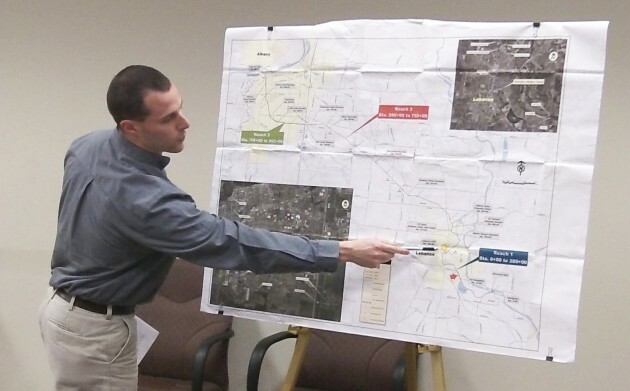 City Engineer Jeff Blaine with a map of the Albany-Santiam Canal at Monday’s Albany City Council work session. Albany is sounding tough when it comes to Lebanon and the Santiam canal. It’s one thing to start negotiations with a hard-nosed attitude. But when it comes to two neighboring towns depending on the same asset, some friendly flexibility would not come amiss. And it would sound better. Albany owns the 18-mile canal. Lebanon draws its water supply from it, needs to build a new treatment plant and therefore needs a new intake upstream from the old one. The Albany council on Monday gave its assent to various conditions on which it would insist before allowing the new intake. First, it wants Lebanon to pay unpaid bills for its share of canal operating costs and capital improvements, an amount ranging from about $250,000 to more than $300,000, depending on who’s counting. Second, Albany wants a new canal contract between the two cities in place. Third, it wants Lebanon to agree to help pay a proportionate share of the $4.4 million that Albany spent in 2005-06 — and is charging its water users for — for a new diversion dam, fish ladder and fish screen at the head of the canal on the South Santiam River. Fourth, Albany wants to own the new Lebanon intake structure after Lebanon builds it and pays for it. (“Dream on,” most people would say to such a demand.) And finally, Albany wants the new canal agreement to settle several points, including how Lebanon would either prevent, or compensate Albany for, the downstream impact of a lot of Lebanon runoff being sluiced into the canal during heavy storms. Albany has technical, practical and legal reasons for everything it wants. But it should recognize that Lebanon has a sudden budget problem and a new administration — mayor, manager and council members — and whatever led to Lebanon not paying its agreed share of canal costs for part of the last several years is not their fault. The staff told the council that Lebanon officials have been trying hard to resolve some of these issues. So it would be wrong for Albany to insist on things that Lebanon cannot meet, at least not right away and maybe never. An agreement from 1986 says Albany bears two-thirds and Lebanon one-third of the operating costs of the entire canal. A more equitable split has to be worked out. Albany needs the entire canal, as a supplemental water source and to run its hydropower turbine. Lebanon needs only the six miles or so from the South Santiam to its current intake. So at the very least, it should be three-fourths on Albany and one-fourth on Lebanon. More equitable would be a split based on miles plus amount of water utilized, or on where on the canal the operating costs are incurred: If at the head gate or upstream of Lebanon’s intake, the cities would share the expense; if between Lebanon and Albany, it would be all on Albany. When Albany and Millersburg started cooperating on a new joint water source and later wastewater treatment plant, they established a management committee with elected and staff members from both towns. It has worked well, from all accounts. Albany and Lebanon should establish a similar forum to handle the canal. Before it comes to that, though, Albany should make sure it does not put too many hurdles in the way of Lebanon moving ahead with its new water treatment plant. This regime just doesn’t learn. This regime is filled with bullies and they’re bossy. Sadly enough, the Albany City Council seems to view their electorate as idiots. During the 1/3-2/3 period, Lebanon did not pay the bill. After the informal agreement of late, the number was much smaller and still not paid. If the total expense yearly is $600,000 and their portion were the 25% that you suggest, their bill would be $150,000 per year, three times what they want to pay, according to the Lebanon Express newspaper. Albany is not trying to pick a fight, but neither do we think that Albany ratepayers should be subsidizing Lebanon ratepayers’ water bills. This is why we stand squarely behind our staff in this negotiation.